Courtney Barnett and Kurt Vile onstage at the Tower Theater in Upper Darby on Friday Nov. 3, 2017. Stella Mozgawa is on drums. Lansdowne-raised and Mt. 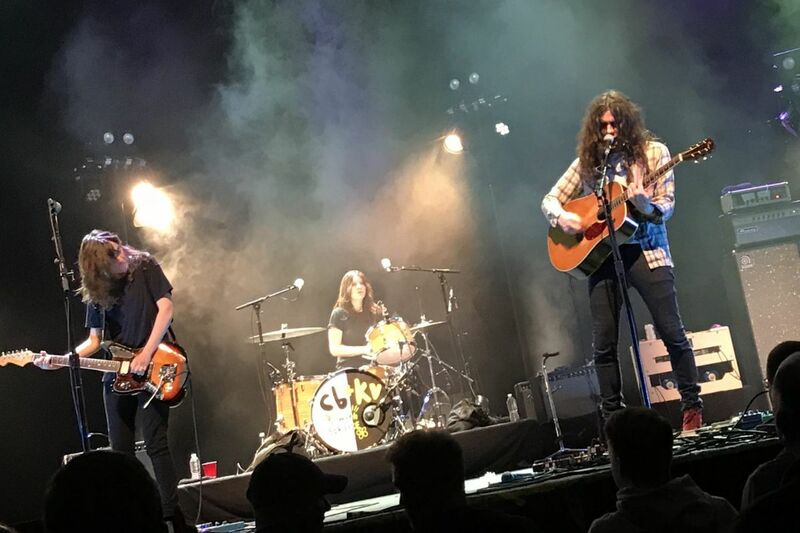 Airy-based rock star Kurt Vile brought his Australian best buddy Courtney Barnett with him to the Tower Theater in Upper Darby on Friday night. It was the Philly date on the duo's tour for their collaborative new album Lotta Sea Lice, but also a special occasion for celebration: Barnett's 30th birthday. The two guitarists both arrived on stage flying the flannel — though Barnett soon ditched her plaid shirt — and played a sweetly engaging 80 minute show that kicked off with their lead single "Over Everything." The duo did selections from their solo catalogues — Vile sang "Pretty Pimpin'," Barnett did "Depreston," which Vile called "my favorite song" — as well as a couple of choice covers in Belly's "Untogether," which is included on Lotta Sea Lice, and Gillian Welch's "Elvis Presley Blues," which isn't. Vile introduced the new album's goofy "Blue Cheese" as "a song I wrote when I was a teenager in Lansdowne," and noted how nice it was "to be back in Philly," and when Barnett agreed, he summed up the situation: "She loves it here, and I'm from here." The show ended with "Avant Gardener," Barnett's breakout alt-hit which is the best song ever written about suffering a near fatal asthma-induced panic attack. Before that though, the singer was surprised by a birthday party featuring gold balloons and a chorus of 2,000 plus singing "Happy Birthday." Barnett's partner Jen Cloher, who opened the show and who will play Johnny Brenda's in January with Barnett in her band, popped back out on stage to film the festivities. Barnett at first used her guitar as a shield to hide her embarrassment, then gave in and egged the crowd on and said, "there's no place I'd rather spend it."